The Morris County Freeholders have declared October to be Domestic Violence Awareness Month in the county. Freeholder Director Tom Mastrangelo issued a proclamation on behalf of the freeholder board to call attention to the seriousness and the extent of the crime. 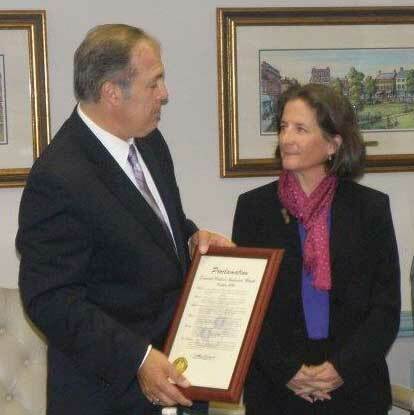 The proclamation was accepted during the freeholder board’s October 12 work session by Patricia Sly, executive director of Jersey Battered Women’s Service, who told the freeholders that in Morris County there are approximately 2,500 domestic violence offenses each year, with many other cases never reported. According to Sly, in the last 10 years, 40 percent of Morris County’s murders have been attributed to domestic violence. The proclamation issued by the freeholders stated domestic violence will be experienced by 1 in every 4 women during her lifetime, most often being victimized by someone they knew, according to the National Coalition Against Domestic Violence. Sly told the freeholder board Jersey Battered Women’s Service answers 5,500 helpline calls; provides 17,000 nights of emergency shelter and transitional housing to hundreds of women and children; accompanies 1,100 victims in court; counsels hundreds of men, women and children; and provides education to 13,000 students and community members each year. A letter to the editor is published verbatim from the author and is not necessary the opinion of the Publisher of Parsippany Focus.